James E. White, founder and director of the Mathwright Library, as well as principal creative force behind the Mathwright software family, died suddenly and unexpectedly July 18, 2004. He was 58 years old, and is survived by his wife, Sally, four children, and two grandchildren. Dr. White received his Ph.D. at Yale University under William Massey in 1972 in Algebraic Topology and an undergraduate degree from Fordham University. He held permanent and visiting faculty positions at many institutions, including University of California San Diego, Carleton College, Bates College, Kenyon College, Spelman College, California State University Monterey Bay, and Stetson University. His non-academic experience included work at Jet Propulsion Laboratory. Major work on the Mathwright project occurred during his tenure at the Institute for Academic Technology at the University of North Carolina Chapel Hill. James White will best be remembered in the mathematics education community for his vision, creativity, and leadership in the applications of technology. He recognized early that computers offer a unique and powerful tool to inspire, captivate, and entrance students, and for 30 years devoted himself to innovative uses of computer technology. His philosophy was that students will learn best when they ask and answer their own questions, and he understood that computer software can create powerful environments in which students are empowered to do so. It was his dream and vision to develop a tool with which teachers and students could easily create these environments. The hundreds of activities housed in the Mathwright Library, created by scores of teachers and students from around the world, bear witness to his successful realization of this vision. Dr. White had a long and active involvement with the Mathematical Association of America. He was co-director of the MAA's Interactive Mathematical Text Project, which introduced dozens of mathematics faculty to the development and use of interactive instructional computer activities, as well as the follow-on internet library project. He was also Principal Investigator for another MAA project, the Web Educators Library Collection of Mathematical Explorations (WELCOME). This project combined three areas of MAA concern: educational technology, professional development, and increasing access to mathematics for underrepresented groups. The project, which was incorporated into the MAA's program SUMMA (Strengthening Underrepresented Minority Mathematics Achievement), worked to bring interactive computer activities to students of minority serving institutions by offering professional development opportunities and mentoring to the faculty of these institutions. His final project for the MAA, completed shortly before his death, involved incorporating materials from the WELCOME project in the MAA's MathDL digital library. James White had a life-long fascination with the world of ideas. He was first a mathematician, with several books and scholarly papers to his credit. He was widely read in mathematics, philosophy, and physics, studied differential geometry and its applications to relativity, and had a particular interest in foundational issues in quantum mechanics. At the time of his death, he was deeply immersed in research in these areas, and had recently completed a paper presenting an innovative new link between the geometric ideas of ancient Greece and the modern subject of special relativity. At the same time, he was fascinated by the issues of cognition and learning, and read widely in this area. Particular influences included Jean Piaget and Seymour Papert. A more complete description of how these influences contributed to White's vision for mathematical software can be found in his biography at the Mathwright Library. He was also a prolific author of interactive computer activities for students, and for their teachers. The Mathwright Library lists nearly a hundred of his contributions, displaying an amazing wealth of creative and inspiring lessons. There is a lunar lander that accurately models the physics of rockets, and gives students a realistic experience of position, velocity, and acceleration. A closely related activity puts students in the driver's seat of a space shuttle to achieve orbit and complete a docking exercise. 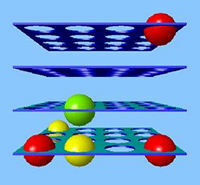 There is a beautifully rendered three dimensional version of tic-tac-toe, and a physically and geometrically accurate simulation of pocket billiards. Most impressive of all, perhaps, is his multimedia survey of gravitation, in which the user navigates a Myst-like virtual world, while retracing the mathematical and physical evolution of our understanding of gravity. And this is just a small sample. He had recently completed a calculus textbook, integrating both traditional text lectures and interactive explorations. How well those lines capture White's intellectual sense of curiousity, awe, and wonder. Through his software and internet library, James White inspired and influenced mathematics students and educators from all over the world. He offered generous encouragement to all who met him, and carried on correspondence with a host of collaborators, followers, and students. His memory will continue to inspire all who knew him. His energy, enthusiasm, creativity, and originality will be sadly missed. An invited paper session in his honor will take place at the January 2005 meetings of the American Mathematical Society and the Mathematical Association of America. The title of the session is Worlds of Interactive Mathematics: The Legacy of James E. White.